Bobby Watson put together a big band and, with the Kansas City Symphony, crammed the Kauffman Center. At the same time, The Folly stood nearly half filled – better than recent shows – for Kenny Garrett. Stan Kessler’s quartet was playing Louie’s Wine Dive over at 71st and Wornall. Ken Lovern’s trio entertained a packed Kill Devil Club downtown while Charles Williams brought piano mastery to The Blue Room at 18th and Vine and Michael Pagán’s trio played The Majestic’s one-time speakeasy and Rob Foster’s violin fronted Take Five way out in Leawood. Later, overnight, crowds would swarm the Mutual Musicians Foundation. And let’s not forget that Lonnie McFadden opened the night at The Phoenix. So don’t try to tell me jazz is dead in Kansas City. Especially when you can add another new club to the list. 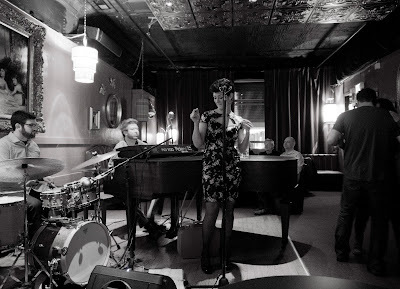 By 9:00 on Friday night, on Grand Boulevard just south of 18th Street, in the Crossroads district, the Green Lady Lounge was filling up for Mark Lowrey on piano, Sam Wisman on drums and Shay Estes’s vocals. 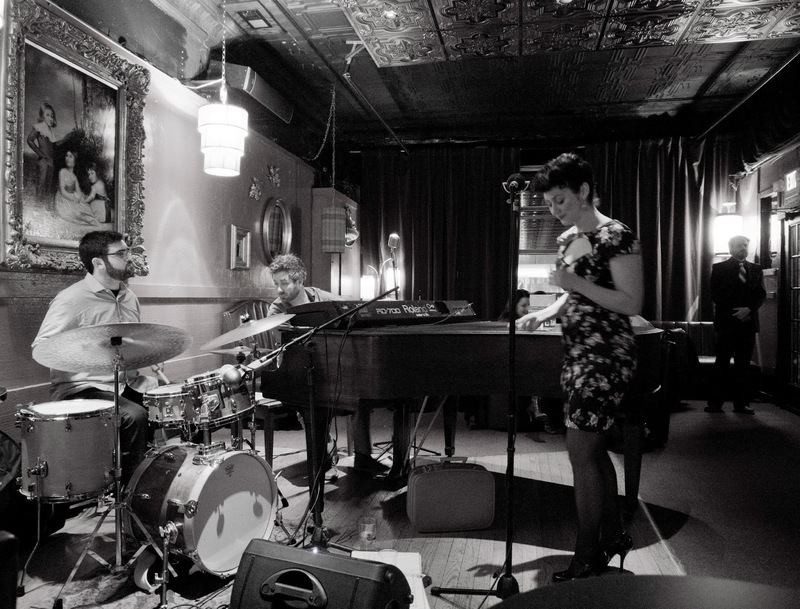 With jazz six nights a week, the Green Lady Lounge is growing an urban audience in a distinctive space. 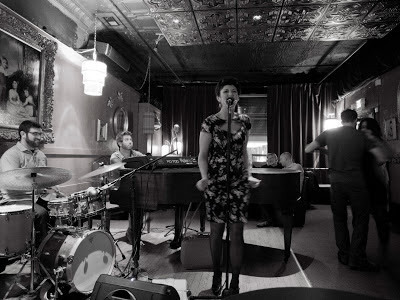 If listening to jazz in Leawood’s Take Five is like enjoying a live band with friends in your uncle’s living room, walking into the Green Lady Lounge is like stepping back in time some 70 years. This must be what it felt like in the jazz bars lining 12th Street when Count Basie and Mary Lou Williams played them. A long, thin space, the bar hugs one wall and black booths the other. A few tables sprinkle the front and back. A tin ceiling hangs overhead. Everything is red: the drapes, the walls. 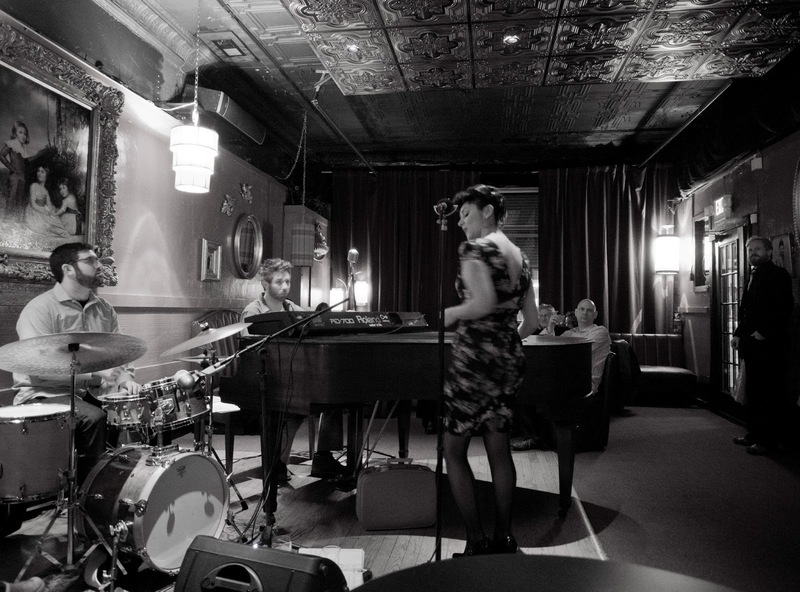 But near the front, as you step inside the door, sits a magnificent grand piano and the space where a jazz band performs. The room can be noisy, but speakers line the walls to carry the music just right. The Blue Room books wonderful music, but looks like what it is: a bar in a museum. The Kill Devil Club is a modern delight. 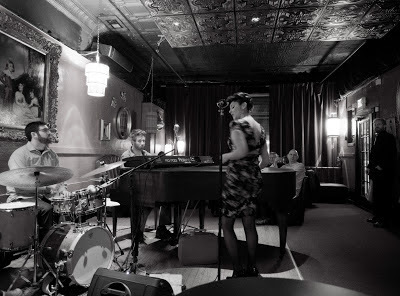 The Mutual Musicians Foundation is authentic history, and downstairs at the Majestic retains its speakeasy heritage. But there is something about this space – maybe it’s the red walls, or the faux-classic paintings hanging on them that pretend to bestow class, or maybe it’s that big grand piano greeting you – that transcends time and leaves 2013 outside the front door. It’s an urban juke joint with a neighborhood atmosphere. Last Friday night, the crowd was friendly, predominantly thirty-somethings, not your stereotypical jazz aged. Some danced. The staff was welcoming. Drinks were priced reasonably. Food is a short offering of small plates. The one I sampled was quite good. The music was superb. Parking, as in most of the Crossroads district, is challenging. But if you don’t mind walking a block, south of 19th Street on Grand, at least last weekend, sat plenty of unused on-street spots. 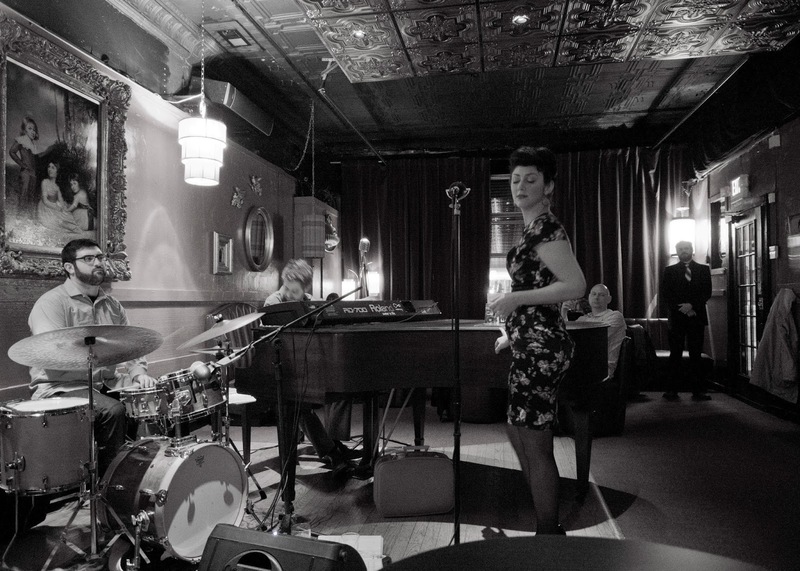 The Green Lady Lounge is quietly building an urban jazz delight. Their website is here. Their calendar is here. Their Facebook page is here. I went recently for the first time. It's a very cool space, with very small-portioned—but spectacularly great—food. And I agree: surely jazz is meant to be heard in a place exactly like this. Could this be the new, younger, hipper Jardine's? I do love this place. And yes....it does feel like stepping back in time and the staff really talks up about "real jazz" and paying homage to KC jazz history. However, perhaps they should learn about said history. I asked about when they will have a jazz jam night, like "back in the day", but no they aren't going to do that because they want to keep it "real". Hello? All the KC greats jammed together. I was telling the story about Mary Lou Williams getting woke up and told to come play because the jam was going on and on and on and the gal I was talking to didn't even know who Mary Lou Williams was! I wonder how different things would have been if there hadn't been a jam for Charlie Parker, you know...back in the day.